NAIROBI, Kenya -- The world’s largest humanitarian crisis in 70 years has been declared in three African countries on the brink of famine, just as President Donald Trump’s proposed foreign aid cuts threaten to pull the United States from its historic role as the world’s top emergency donor. If the deep cuts are approved by Congress and the U.S. does not contribute to Africa’s current crisis, experts warn that the continent’s growing drought and famine could have far-ranging effects, including a new wave of migrants heading to Europe and possibly more support for Islamic extremist groups. The conflict-fueled hunger crises in Nigeria, Somalia and South Sudan have culminated in a trio of potential famines hitting almost simultaneously. Nearly 16 million people in the three countries are at risk of dying within months. 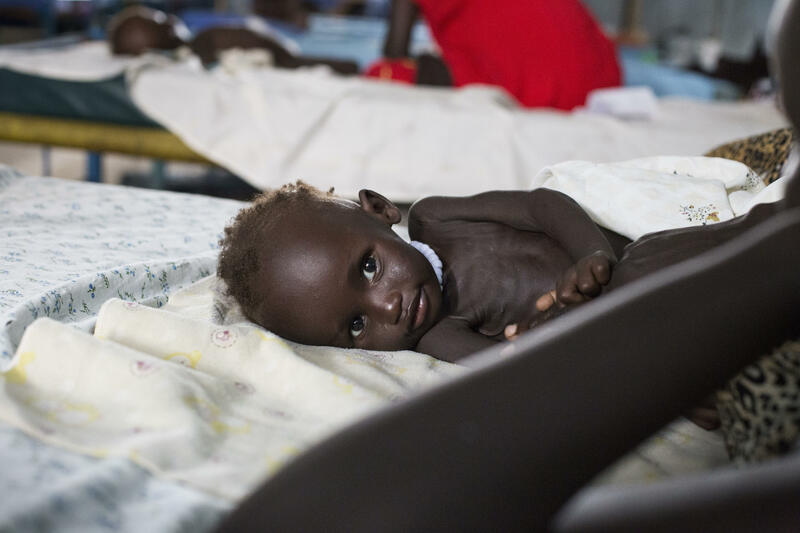 Famine already has been declared in two counties of South Sudan and 1 million people there are on the brink of dying from a lack of food, U.N. officials have said. Somalia has declared a state of emergency over drought and 2.9 million of its people face a food crisis that could become a famine, according to the U.N. And in northeastern Nigeria, severe malnutrition is widespread in areas affected by violence from Boko Haram extremists. “We are facing the largest humanitarian crisis since the creation of the United Nations,” Stephen O’Brien, the U.N. humanitarian chief, told the U.N. Security Council after a visit this month to Somalia and South Sudan. At least $4.4 billion is needed by the end of March to avert a hunger “catastrophe” in Nigeria, Somalia, South Sudan, and Yemen, U.N. Secretary-General Antonio Guterres said in late February. But according to U.N. data, only 10 percent of the necessary funds have been received so far. Trump’s proposed budget would “absolutely” cut programs that help some of the most vulnerable people on Earth, Mick Mulvaney, the president’s budget director, told reporters last week. The budget would “spend less money on people overseas and more money on people back home,” he said. The United States traditionally has been the largest donor to the U.N. and gives more foreign aid to Africa than any other continent. In 2016 it gave more than $2 billion to the U.N.’s World Food Program, or almost a quarter of its total budget. That is expected to be reduced under Trump’s proposed budget, according to former and current U.S. government officials. “I’ve never seen this kind of threat to what otherwise has been a bipartisan consensus that food aid and humanitarian assistance programs are morally essential and critical to our security,” Steven Feldstein, a former deputy assistant secretary of state in the Obama administration, told The Associated Press. The hunger crises in Nigeria, Somalia and South Sudan are all the more painful because they are man-made, experts said, though climate change has had some impact on Somalia and Nigeria’s situations, said J. Peter Pham, the head of the Africa Center at the Atlantic Council. South Sudan has been entrenched in civil war since late 2013 that has killed tens of thousands and prevented widespread cultivation of food. In Nigeria and Somalia, extremist groups Boko Haram and al-Shabab have proven stubborn to defeat, and both Islamic organizations still hold territory that complicates aid efforts. If Trump’s foreign aid cuts are approved, the humanitarian funding burden for the crises would shift to other large donors like Britain. But the U.S.’s influential role in rallying global support will slip. “Without significant contributions from the U.S. government, it is less able to catalyze contributions from other donors and meet even minimal life-saving needs,” Nancy Lindborg, president of the United States Institute of Peace, said in prepared remarks to the Senate Foreign Relations Committee on Wednesday. Meanwhile, neighboring African countries will feel the immediate consequences of famine, experts said. On Thursday, the U.N. refugee chief said Uganda was at a “breaking point” after more than 570,000 South Sudanese refugees had arrived since July alone. Others fleeing hunger could aim for Europe instead. “We are going to see pressure on neighboring countries, in some cases people joining traditional migration routes both from the Sahel into Europe, or south into various destinations in Africa,” Joseph Siegle, director of research at the Africa Center for Strategic Studies, told the AP. “You have 19 countries facing some degree of food stress in Africa, and three of them are facing famine conditions. All three of them are facing conflict, and the vast majority of the countries facing more serious crises are non-democratic governments,” Siegle said. He described a series of possible consequences. Most likely there will be increased flows of people migrating from Somalia and the vast Sahel region north into Libya, where trafficking routes are a valuable source of finance for the Islamic State of Iraq and Syria (ISIS), he said. Closer to home, people from South Sudan and Somalia seeking food likely will strain the resources of neighboring countries where political will and goodwill to refugees can be fleeting, said Mohammed Abdiker, director of operations and emergencies with the International Organization for Migration. The regional consequences will depend on how the international community responds, Abdiker said.